Have you ever wondered how children perceive themselves and their families' reactions after being diagnosed with diabetes? It's tough fighting diabetes, a disease that they might not understand and certainly can't see. I'm Still Me--Can't You See? 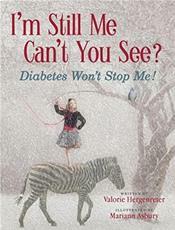 is told through the eyes of a child conquering diabetes. Together you will find inspiration and peace as you fight an invisible disease. The rhythmic story along with the imaginative illustrations will entertain and empower your child. The last page is dedicated to families who have the power to triumph over the hardest of situations and give hope for a healthy future.